Hi everyone! LeAnne here with our winning choices! What a fun assortment of sweet treats were arrayed in the gallery! So cool to see what everyone created! Before we get to my choice for Headliner, let's see what caught the eye of the Design Team this week. 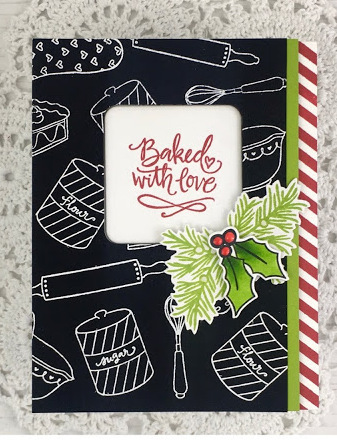 Tricia's delightful background and simple embellishments really made this card a stand-out! Congrats on being my Headliner for this week! Thank you again to everyone for playing along with us. Congratulations to all our winners, please pick up your badges here. Come back tomorrow for a sensational sketch from Sandy! Congrats to everyone and a big shout out to Shery and Tricia! Thank you Laurie for choosing my card . Congratulations to the winner and others too. Yay! Thank you, Jaydee, for picking my coffee Christmas tree card :-) Congrats to everyone! Thank you for selecting my card!! Congratulations to all! I love Tricia's card too! Thank you Claire for selecting my pie card. This is a really fun fold to do. Oh Ann Thanks for liking pie.....lol......I am honored my card is among such fabulous designs! Always fun to play with the Players!